Bruno Martini Ita-160. I just want to say thanks to POINT-7 for all your support, but after 3 years toghether we have not reached my goals, so is time to go and find my way. Ricardo Campello : Very sad to Announce that I won't be riding Point-7 sails for 2019. RRD International. We announce that Cyril Moussilmani will compete with RRD sails during the 2019 racing season. It's the first time in the RRD history that a top level slalom racer is full equipped with RRD products. He participated, together with John Skye, in the development of the new X-WING MK1, pure performance race sail. 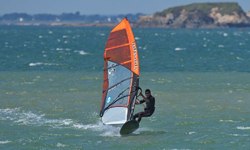 Alexandre Cousin FRA 752 quitte Gaastra Windsurfing pour le team Phantom Windsurfing. Maciek Rutkowski. I'm very happy to announce I signed a 1year contract extension with Challenger Sails for the 2019 season! Cant wait to continue building! Here a 1-2 we had in one of the heats in Sylt. Ricardo Campello : It’s sad to see where the windsurfing business is , I’m current second in the world rankings and I’m struggling to find a sail sponsor , not because I didn’t have offers from brands but all the offers were not convinient financially speaking ! Where is this taking out sport? Sometimes I just want to Stop and look for new adventures in my life , but my dream is to become wave world champion and spend most of my time on the water ! Il passe de pryde a gun également a priori.